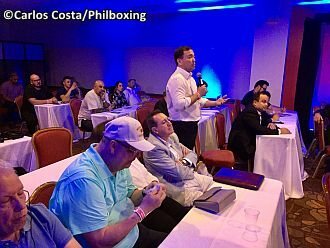 PANAMA CITY, Panama -- One of the important points addressed by Philippines GAB Chairman Baham Mitra during his participation in the recently concluded WBO 31st Convention here in Panama was the issue of the Manny Pacquiao-Jeff Horn scoring, a very hot subject among the Filipino boxing community last year. In that title fight, Senator Manny Pacquiao surprisingly lost his WBO Welterweight World Title to Australian rough brawler Jeff Horn, and in the eyes of GAB Chairman Baham Mitra the failure of referee Mark Nelson to warn Horn from employing illegal antics throughout the course of the combat might have affected the outcome of the highly-anticipated "Battle of Brisbane." "To me, this is very important. We were present in the fight of Senator Pacquiao and Jeff Horn in Australia, and we were disappointed on how the fight was handled by referee," said Baham Mitra in Panama. "Then of course disappointed of the result. There was an uproar in the Philippines and also in social media social media after the fight. We were so disappointed that Senator Pacquiao was not able to defend the crown.. the belt." "However, you can not expect somebody as gentleman as Senator Pacquiao to protest." "Therefore, me, together with GAB Commissioner Edward Trinidad and at the time GAB commissioner Fritz Gaston - we were all together in attendance there in Australia - so we took it upon ourselves the duty to formally write a letter of complaint to the leadership of the WBO. "Today (Nov 1) after more than a year, I was able to rely on behalf of the Games and Amusement Board our gratitude to the WBO for acting on our complaint. Mitra talks about the Pacquiao-Horn issue during the 31st WBO Convention in Panama (top) and confers with WBO official Michael Pernick (above). "Therefore, we concluded that it was not at all the fault of the judges. It was the fault of the referee Mark Nelson on how the fight was handled, said Baham Mitra, a former Governor and Congressman. "Because the judges score only according to punches thrown and punches that land." "So we felt very strongly that during the fight warnings should have been given (to Horn) and points deductions should have been given to fight to get clean and to avoid further damage to our honorable Senator. "After the fight, I asked people close to Pacquiao what they intended to do. They said to me that being a gentleman, Pacquiao would keep quiet about it and would let the issue fade away, and eventually come back later on," shared Mitra. "However, it is our job as the Philippine government agency in charge of boxing to act. Because we were present we saw what happened and we were not going to allow that to happen just like that. "The WBO is such a prestigious organization; we were happy that they acted on our complaint. "In fact, the head of the WBO championships committee approached me to tell me what they have done. "Because the Pacquiao-Horn was such a big fight for us, and the world was watching and it was very clear that the referee Mark Nelson did not do his job. "Referees do not score, but Nelson's failure to deduct points or give strong warnings to Horn had consequences on the scoring of the judges, so that is why we asked the WBO about this. "And the fact the the WBO acted forming a committee and came up with a conclusion was positive." "That was about a year ago. Now, Senator Pacquiao is back. He is a world champion again with another belt, and we are happy. "In conclusion, we feel satisfied with the WBO for acting on our request. We are happy with the WBO," concluded Baham Mitra, chairman of the Philippines Games and Amusement Board. The author Carlos Costa is a Panama-born man of boxing based in Cebu, Philippines. He attended the WBO Convention in Panama. Carlos can be reached by email: Carlos512@hotmail.com and Whatsapp: +639184538152.